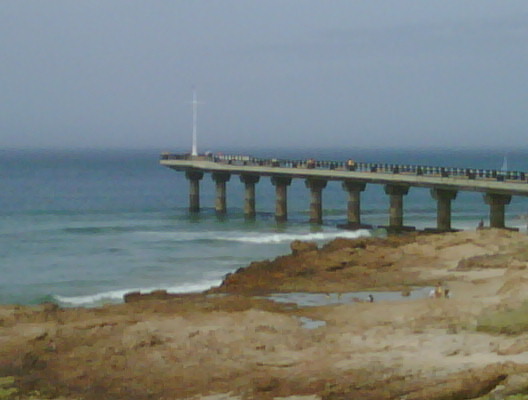 Had a conference down in Port Elizabeth (PE), the host city to IMSA this week and picture above for those not knowing is the pier on the swim course. With VW (franchise) and Kelston's (company I work for) headquarters down in PE, I do visit the IM host city quite often and every time I am down there I just have this amazing feeling and reliving all those special IM moments. One thing I can say about the new company I work for is that they are just amazing. What a difference attitude make. The things that was promised to me which never materialized after I constantly asked for it the past two and a half years at the previous company happened at the new company within three months without me asking or reminding them once. Just shows you! Well family wise it's going to be a very quite weekend with DJ at a school camp until Sunday. My sister and Gerhard also finalized their wedding date, which will be the 7th of May. As you can imagine 99% of topics/discussions and arrangements in our house are now about the wedding. We've also lost an Uncle, on my fathers side and an Aunt, on my mothers side the past two weeks. Not nice no matter what you say. I am very sorry for your losses though. J, glad to hear things are going well for you. Sorry to hear about the passing of your relatives. Thanks, yes not nice losing a couple of family members. Great to hear training is going well! I can just imagine how PE makes you feel. Sorry to hear about the losses in the family. Always sad. Have a good weekend Johan! IMSA looks like it could be a great event!